When I first heard the news, I honestly didn't know what to think. Tommy Hancock of Pro Se Productions was seriously ill (which I would later learn involved his heart), so Jamie Ramos had presented an idea to Ron Fortier and Rob Davis of Airship 27 (yes, the friendly competition!) to do a benefit anthology on Tommy's behalf, with Hancock getting all the proceeds to help his family out with medical expenses and other bills. Of course, I volunteered to contribute a story immediately. 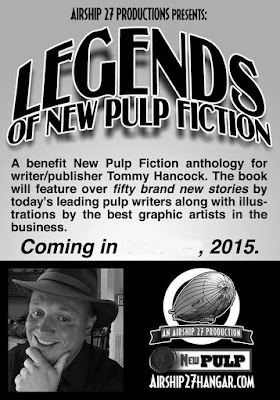 For those of you who don't know Tommy Hancock, you would be hard pressed to find a nicer or more knowledgeable man in this crazy creative field that we call "New Pulp". There would be less talent out there now if Tommy hadn't given them (and me) their first big break, so it's only natural that when the need arose, we'd rally to return the favor somehow. Now, this is far from the first time that a group of people in one specific field united in a common cause and "paid it forward", so it didn't surprise me at all that our small little creative community of writers and artists got together to help out one of our own. The fact that we were able to do so in such a spectacular manner is what flabbergasted me! 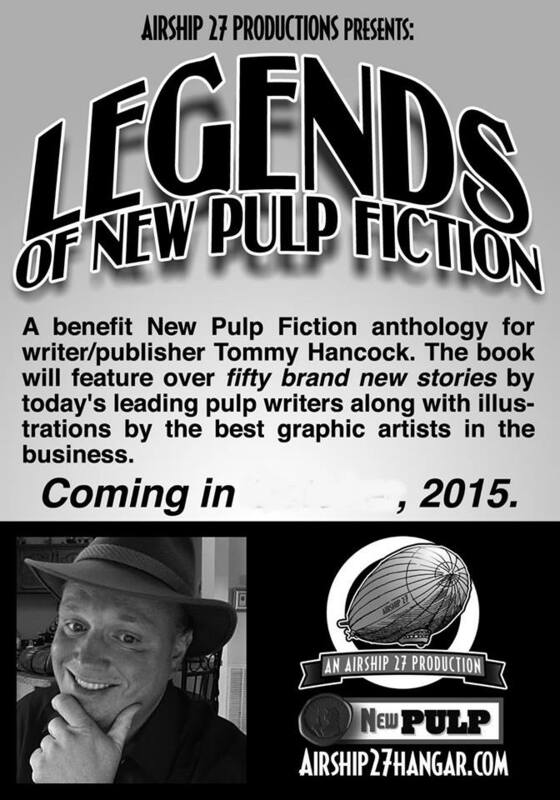 The end result of everyone's hard work is LEGENDS OF NEW PULP FICTION! 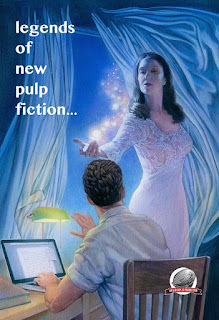 At first, the projected totals were (as expressed by the black and white "in-house" poster that was circulated) that the anthology would obtain a tad over fifty contributions, but the project wound up with 64 writers (including Tommy) and 37 artists helping to provide an illustration to each tale under a gorgeous cover by Doug Klauba! At 776 pages, this is the biggest volume Airship 27 has ever published (to date) and Ron and Rob, along with Jamie and associate editor Todd Jones, deserve a hearty round of applause and time off to rest and recuperate from all their hard work. 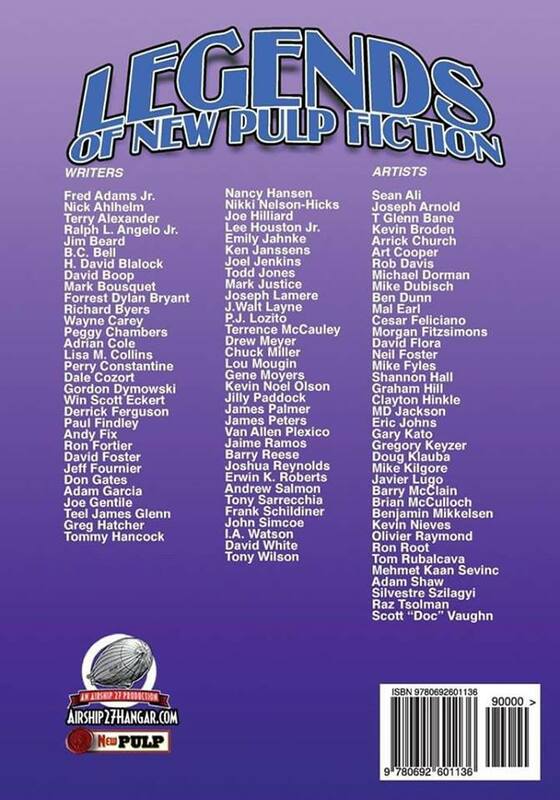 As you can see by the back cover list, there is a plethora of creators representing a wide variety of pulp genres within this anthology. Everyone had a small word count (4,000 minimum/8,000 maximum) and a short deadline. At first, I seriously considered writing a short story featuring one of my "signature" creations, but there was no way I could do an ALPHA the superhero story without tipping my hand in regards to plot points that will be revealed within his forthcoming second novel, and I honestly didn't know the legalities that might be involved if I did a short HUGH MONN, PRIVATE DETECTIVE mystery. But that left me with the quandary of what to write? One thing you must know about New Pulp is its definition. We are telling brand new stories in the classic pulp style of the past with modern sensibilities. Being pressed for time, I intentionally set my tale in the present day to avoid any potential research snares that might arise from doing a period piece, and therefore, a couple of days later, the result was "The Unfair Fare", which came in at a modest 4,677 words. The story, complete with such modern references as GPS and flash drives, was then sent to Airship 27 for consideration. Damn, Lee, that was a fun little gem. I really liked that a lot. Great story...authentic pulp feel throughout. THAT certainly made my day! The stories are presented in order, alphabetically based upon author's last names, so I am in-between "Señor Tijras" by Joe Hillard and "The Gentleman Thief and the Artist" by Emily Janhke, with an illustration by Joe Arnold. The one thing I could never decide upon was WHO the cab driver should be, so I'll leave it up to your opinion dear reader as to who the driver is. 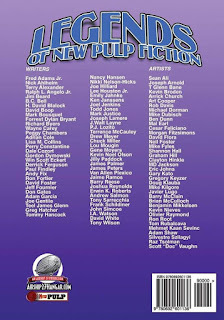 Otherwise, on behalf of myself and everyone else involved with this anthology, we really hope you like LEGENDS OF NEW PULP FICTION.